Carla Vorndran, BS, MBA, FAACVPR works at the University of Michigan in the Cardiovascular Medicine department. She graduated from Central Michigan University with a BS in Health Promotion and Rehabilitative Programs and completed her Master’s in Business Administration from the University of Michigan – Flint in 2008. She was the Exercise Physiology student internship coordinator for seven years. 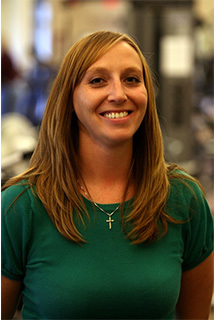 Currently, Carla is involved in phase II Cardiac rehab case management, non-invasive cardiac stress testing, performing external counter pulsation (ECP) treatments, and is the scheduler for the Exercise Physiology staff. Carla has had an active role within the American Association for Cardiovascular and Pulmonary Rehabilitation (AACVPR) for about eight years. During that time she has become increasingly involved within the organization. She just completed her time as chairperson for the Membership and Affiliate Relations committee and is currently involved with the education committee and the Annual meeting planning committee. For her service nationally and within the affiliate Carla was awarded Fellowship from the AACVPR. Carla has been a part of the ESS department since May of 2013 when she began piloting the ECG interpretation course. Since then she has also added the Pharmacology for the Physical Activity Professional online course. She enjoys teaching clinical subjects that can be useful to students that plan to work in any clinical area. Carla developed a passion for women’s heath, specifically cardiac health, from working with female cardiac rehabilitation participants. Seeing the physical and emotional changes after a cardiac event and helping women redefine their roles as a mother, professional, and care-giver has fueled that passion and drives her to be a part of programs that can make a difference in women’s health. She also has a strong interest in cancer related cardiovascular disease. She also has a passion for survivorship programs for patients that have completed their care for cancer and patients in the Cardio-Oncology program.